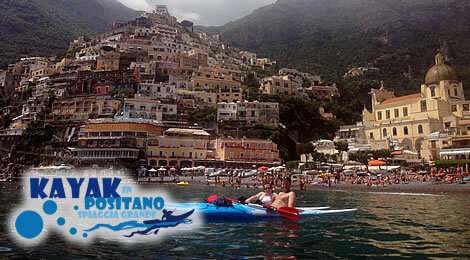 Located in the Pearl of the Amalfi Coast, at the “Spiaggia Grande” in Positano, Kayak in Positano offers the unique opportunity to admire from the sea the landscape of one of the most beautiful coasts of Italy and the world, The Amalfi Coast, in a unique, fun and environmentally friendly way: by Kayak. A unforgettable experience is waiting for you! The times of the tours are flexible, you can book full day or half days on request. 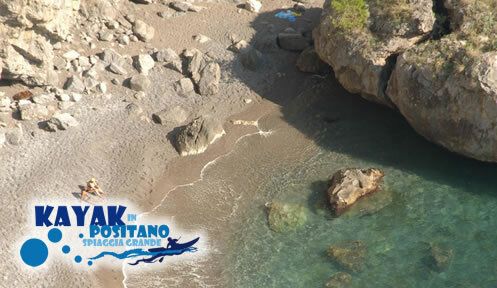 Along the coast, exploring the beaches, caves and coves that characterize it and make it unique, during te excursion we will stop to swim in isolated beach, away from the crowd, to snorkle or dive. 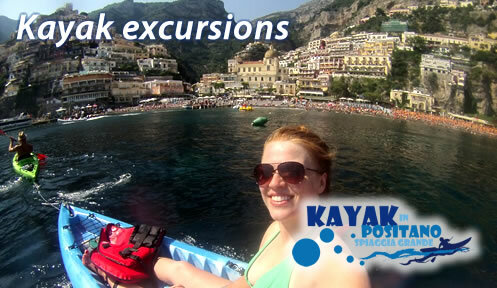 Excursions at sunset, to enjoy the quietness of that time of the day and to watch the sun slowly disappearing in the water or beahind the mountain, while the sky keeps change colors, with Li Galli islands and the Faraglioni of Capri as a frame, at the end of the tour de will enjoy some Prosecco on the kayaks overlooking Positano. 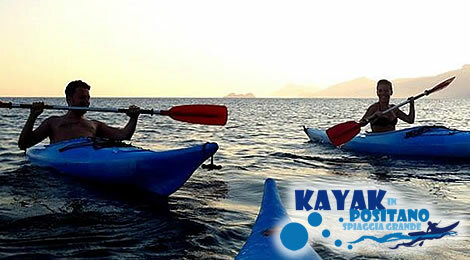 Sunrise excursions, to enjoy the peace and the colors of the sea and the coast before all the boats start running. 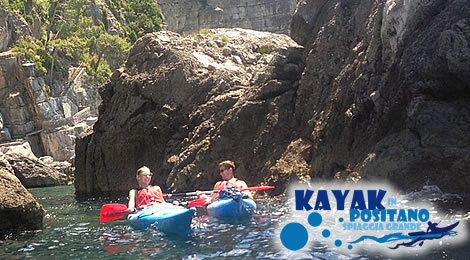 During the evenings of the full moon, in summer, we also organize kayaking to enjoy the sea at night and the spectacle offered by the reflection of the moon on the water with the stunning Amalfi coast in the background. 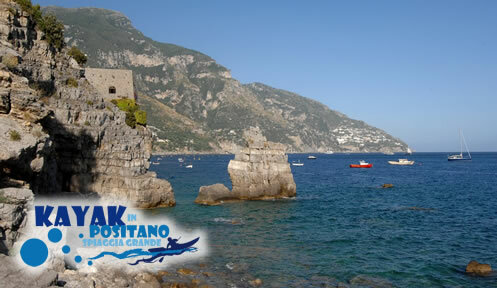 We organize excursions of half day or full day. 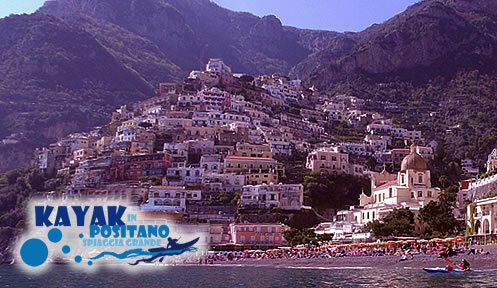 We can plan departure and arrival from any beach of the Amalfi Coast. We do also private excursions. 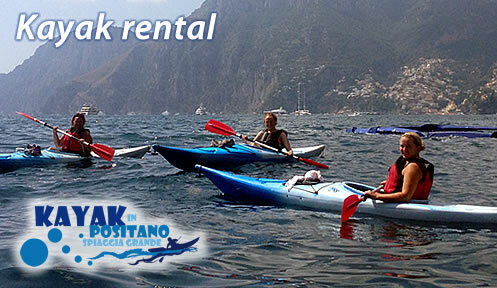 Kayak in Positano provides you with all the necessary equipment and the assistance of a person who will accompany you during your excursions. 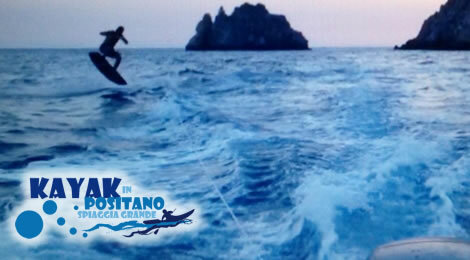 The Windsurf Kayak Praiano offers the unique opportunity to do Waterskiing and Wakeboard in a wonderful setting such as that of the Amalfi Coast! 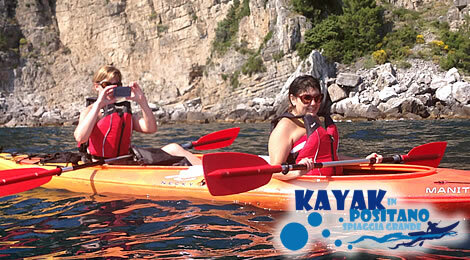 Every Wednesday we organize a full day dedicated to outdoor activity, joining trekking to kayaking! Starting from Praiano go up to San Domenico Monastery (364 m above sea level) which later reach the famous Path of the Gods (500 m asl) that will take us up to Nocelle, in the upper part of Positano. Once there we will consume a light lunch of seasonal fruits and vegetables and we relax a bit 'before getting down to the main beach in Positano. Arrived at the beach we will have a refreshing bath before getting aboard our kayaks to return to Praiano where we came from! You will have a way to fully enjoy the spectacle that is our Coast, first from above and then from the sea. 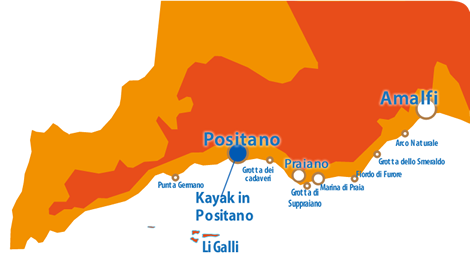 We can arrange it also starting from Positano, we will kayak to Praiano and from there hike up to the Path of the Gods that will tak us back to Positano! The duration is approximately 7\8 hours and is recommended for people who are familiar with hiking since there are many stairs to do both uphill and downhill. But I can guarantee that you will live a unique experience! 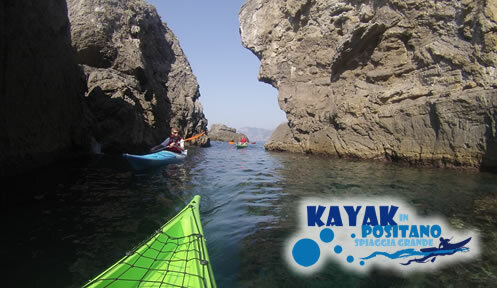 The price is € 95 per person and includes a guide that will take you hiking and a person that will take you kayaking with of course the necessary equipment (kayak, paddle, life jacket and waterproof bag).